We have already written a lot about the importance of medical app development. Now it's time to take a look at the leaders in this field so that you could follow their cue. Undoubtedly, today the most popular mobile healthcare service is the one named Health4me and aimed to simplify the process of health monitoring. This raises the question of how to make the app like Health4me. Let's master the subject at length. a tool for monitoring of vital health metrics. These healthcare applications are targeted at both doctors and patients. Loosely speaking, this service helps the doctor and his patient "find each other", simplifies their interaction and, as a result, improves the effectiveness of the treatment process. Among other things, this mobile app can come in handy for finding the right medical expert, appointing a meeting with a physician, etc. Such mobile healthcare apps are extremely useful for emergency cases when a person needs urgent medical assistance. This service will help a customer find the nearest emergency room, make an emergency call, etc. As a bonus, the desire to build a mobile app of this sort can lead to saving a lot of human lives! The effectiveness of the treatment methods depends on how strictly we're following the doctors' prescriptions. Among other things, it is very important to take our drugs at regular intervals... alas, few of us have a good memory: we forget about our healing pills, as a result, we are not recovering... These mhealth apps are designed for these very cases. They not only help to track taking the drug but also provide access to a huge database of medications with a detailed description of each one. This service is similar to drugs monitoring apps but of a more general type. This is a reminder aimed at controlling your health. Do you need to take your medicine or visit a doctor? This mobile app will admonish you in advance about these and other tasks related to health monitoring! These are mobile healthcare apps of the information type that are most popular among doctors. However, ordinary users can find this service also helpful. It offers ICD-9/10 reference guide, different specialized medical informational materials, etc. The main thing is to update this content regularly so that it would remain relevant. Now we’re talking about applications for the healthy lifestyle that is so popular right now. Agree, with the health and wellness services, it's so much easier to lead a healthy life! Therefore, the healthcare application development aimed at creating tools for monitoring well-being is now in extremely high demand. Of course, this division into types is very conditional. It gives us an understanding of what exactly a modern user expects and wants to get. Undoubtedly, this information will be helpful if you want to create an app like Health4me. 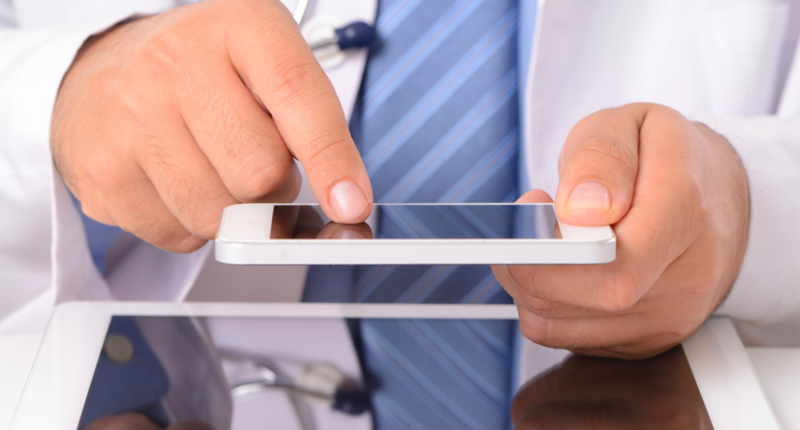 Mobile healthcare app development is the future of healthcare. Read this blog post to find out why! And now let's take a deeper look at the Health4me mobile app. What makes it special and popular? What is the main advantage of this sought-after application? You need to sort it out if you want to make an app like Health4me and succeed. Multifunctionality. Health4me is not focused on one thing, it affects many aspects concerning the control of one's health, and replaces several healthcare mobile applications. In other words, it allows you to fully look after your health including seeking external medical assistance, monitoring vital signs, etc. It also offers you different reminders, online help, and much more. Ergonomic involving clear navigation and user-friendly interface. Obviously, the mobile app development process was carefully thought out. Focusing on the user’s comfort, the healthcare app developers had definitely taken into account every detail. As a result, users prefer this application choosing it among others. The effective marketing strategy. It's not enough to make a healthcare app of high quality, it's necessary to skillfully promote it and attract the users’ attention. One needs to interest new users and keep the old ones. Obviously, Health4me owners know how important marketing is. If you want to build a healthcare app like Health4me and emulate its success, you need to choose the features for your service correctly. Let's see what can be recommended as the best options in this case! Assessment of medical care cost. This feature of the healthcare application will help the user to draw up his budget correctly against spending extra money. Checking account balances. This is one more good feature for saving your user’s budget. A searching tool aimed to help users look for doctors, pharmacies, hospitals, etc. The ideal option is the offered possibility to choose objects with certain filters (location, specialization, price segment, etc.). Online chat. This feature is helpful for any mobile app, it allows users to communicate with you in order to get the information they’re interested in. Of course, it means you have to employ people for monitoring your service all the time but it’s the only way to make a ten-strike. Personal cabinet with all the data on one's health condition. A user can create his own health record and, if desired, share this information. The medical emergency call. Ideally, you should provide your users with the possibility to converse with skilled healthcare experts. The Health4me mobile app was designed with this important factor in mind, and a potentiality to contact an experienced registered nurse 24/7 has become another of its differential advantages. Monitoring medical instructions and prescriptions. Due to this feature, the user can always check whether he has carried out all the doctor's instructions. Searching for drugstores and filling prescriptions. This feature of the mhealth app can also come in handy for a user to look after his health properly. Comparison of prices for drugs. This feature will help the user to choose the best drug option. Checking status of prescriptions. Thanks to this feature, a user can see if he needs refills or renewals. Feedback. Users' reviews will allow them to express their opinion about the work of your healthcare application, so you'll be able to learn about the weaknesses of your mobile service and remedy this. Features for healthy living. You can supplement your health app with features that will provide users with the possibilities to lead a healthy life: for example, diet assistance, fitness help, etc. Now we'd like to give a few general tips on how to make an app like Health4me. We hope these simple recommendations will help you find a way to popularize your mobile health service. Explore the mhealth app market. Analyze your competitors' strategies, think about which of their ideas you can adapt or improve. Try to be always one step ahead. Create a user-friendly interface. People do not like to look for anything for too long, especially when it comes to health! Therefore, the longer they're searching for the desired information, the more likely that this app will be deleted. They will abandon it in favor of more convenient and intuitive mobile services provided by your competitors. If you don't want such a result, be sure to pay proper attention to each stage of the app development process. Do not philosophize, be simpler! Be on the same wavelength with your users. The content of the mobile health app must be accurate, clear and understandable to a typical user. Use active promotion. The popularity of the most first-class application will be conditional on competent promotion. That’s why you will need to hire experienced marketers in addition to app developers. Don’t forget about social media. Increase mobile app engagement through the integration of social networks. You can read more about this subject here. Remember about constant updating. Move with the times improving your mobile health service and offering new features as well as the updated old ones. Use push notifications. Do not let the user forget about your application - remind of yourself through the push notifications. But don’t be too intrusive! Process all the reviews. Do not neglect the users' feedback: respond to everyone, react, if you can fix something - do it! Users will appreciate your initiative. Offer promotions and discounts. From time to time, make your regular users interesting discount propositions. Find the right way to monetize. The best option is to create Light and Pro versions of your healthcare app. Another good method to make money is to offer free basic functionality supplemented with several exclusive paid features. As you can see, in order to create the app like Health4me, you need to have all bases covered. employ a support team. These people are responsible for maintaining the activity of your mobile health app. Conduct desk research. You can accomplish this task on your own or use the services of a professional company. The second option is more expensive, but the result will be more accurate. Decide what type of healthcare app you want to get and prepare the detailed project development plan. This stage means creating the prototype that includes the wireframes of each app screen and the detailed user flow. The design studio you’ve hired should provide your app with a clean and intuitive interface. This healthcare app development stage is the most important one. Your app developers should implement your idea by writing clear and accurate code and using the latest IT technologies. This stage is sometimes neglected which is an obvious mistake! An experienced QA team is able to conduct a set of app testing processes and eradicate technical errors. All these activities are aimed to guarantee the high quality of the final product - your health app. Your app should be published correctly and in time, that is as soon as it is ready. The importance of this last stage we’ve already discussed. Do you want to get a flawlessly working mhealth app without overpaying? If the answer is yes, choose our Agilie team! We know how to make the app like Health4me (and even better!) and are ready to offer you our services. Thanks to our expertise and a qualified approach, mutual cooperation will be productive, and the result will exceed your expectations: you'll get a mobile service worthy to join top lifestyle apps! Today there is no doubt that all companies including medical organizations need their sites. Read this blog post to know why.